Diploma in Mechanical Engineering With a minimum of 55% marks. Diploma in Electronics / Electrical Engineering With a minimum of 55% marks. BE / B Tech in Electronics / Electrical / Instrumentation / Mechatronics Engineering With gate / net score. ME / MTech in Electronics / Electronics and Telecommunication / Electrical / Electronics and Instrumentation / Mechatronics Engineering. BE / BTech Electronics / Electronics and Telecommunication / Electrical / Electronics and Instrumentation / Mechatronics Engineering. With gate / net score. BE / B.Tech. Two years experience with 55% marks in electrical engineering. ME / M Tech in Electrical Engineering With 55% marks. BE / B.Tech. In computer science and engineering With a minimum of 55% marks. BE / B.Tech. In computer science and engineering / IT with minimum 55% marks. With 55% marks in MSc Chemistry / Physics / Polymer / Materials / Nanotechnology and Nanotechnology. MSc in Chemistry with 55% marks. BE / B Tech in Chemical Engineering With a minimum of 55% marks. BE / B Tech in Chemical Engineering With a minimum of 55% marks and 2 years' relevant experience. BE / B Tech in Chemical Engineering with 55% marks. BE / B Tech in Mechanical Engineering With a minimum of 55% marks. BE / BTech in Instrumentation / Electronics and Instrumentation / Electrical and Instrumentation / Control System and Instrumentation / Applied Electronics and Instrumentation / Instrumentation and Control Engineering With a minimum of 55% marks. MTech Instrumentation / Electronics and Instrumentation / Electrical and Instrumentation / Control System and Instrumentation / Applied Electronics and Instrumentation / Instrumentation and Control Engineering With 55% marks. BE / BTech in Mechanical / Production / Automobile / Manufacturing / Industrial Design Engineering With a minimum of 55% marks. MTech in Mechanical / Production / Automobile / Manufacturing / Industrial Design Engineering With 55% marks. B.E./B.Tech. In computer science and engineering / IT with minimum 55% marks. BSc in chemistry / physics with 55% marks. After receiving the MSc National Eligibility Test (NET) qualification, chemistry (preferably inorganic chemistry) in physically and visually handicapped candidates). Interested and qualified candidates can participate in the walk-in interview at the bottom with the application available from 04.10.2018 to 05.10.2018 on the official website cmeri.res.in. Participants need a walk-in-interview to bring the original certificate with Xerox copies that are participating. Interested and eligible applicants may download the required form from the website www.cmeri.res.in and submit their application form on 20 or 21 June 2018 or earlier. The prescribed form along with a photocopy of all relevant documents should be sent to the address below. CMERI Recruitment 2018 – 39 Technician Posts launched notification for the recruitment of the posts of 39 Technician under CMERI Recruitment. All Eligible and Interested candidates can also observe Offline mode before Last Date i.E., 21-05-2018. Other Details Like schooling qualification, age restriction, choice procedure, utility price & how to follow, essential hyperlinks, syllabus, admit playing cards, outcomes, preceding papers . SSC/tenth general with Science subjects with no longer much less than 55 % marks plus ITI certificate inside the related change or National / State trade certificates in a related alternate or 02 years full-time experience as an apprentice trainee. 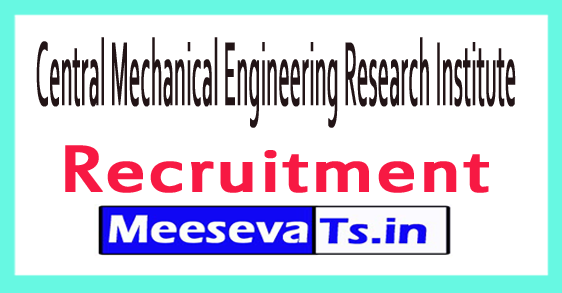 Address: The Administrative Officer, CSIR-Central Mechanical Engineering Research Institute Mahatma Gandhi Avenue, Durgapur – 713 209 (West Bengal).